The exhibition was inaugurated on Tuesday, December 11, 2018, at 17:30, at the Postal and Telegraphic Central European Museum in Trieste. 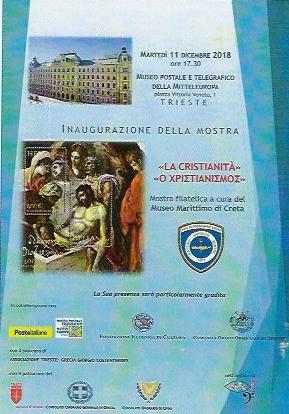 It is titled “Christianity” and is part of the collections of the Maritime Museum of Crete, which has its editing. The exhibition will remain open until 20 January 2019. 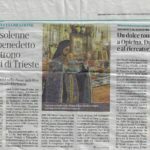 It was organized by the Hellenic Foundation for Culture of Italy in collaboration with the Telegraphic Museum of Central Europe, the Community of Greek Orthodox Trieste and with the support of the “Trieste-Grecia Giorgio Constantinides” Association. 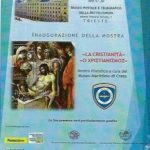 The event is under the auspices of the Municipality of Trieste, the Honorary Consulates of Greece and Cyprus in Trieste and is included in the program of events celebrating Saint Nicolas, patron of the Greek Orthodox Community of Trieste. The exhibition is an action of the “Tempo Forte Italy-Greece 2018” program, promoted by the Italian Embassy in Athens and ratified at the first Intergovernmental Summit between Italy and Greece on 14 September 2017 in Corfu with the aim of cultivating and supporting cultural relations between the two countries. 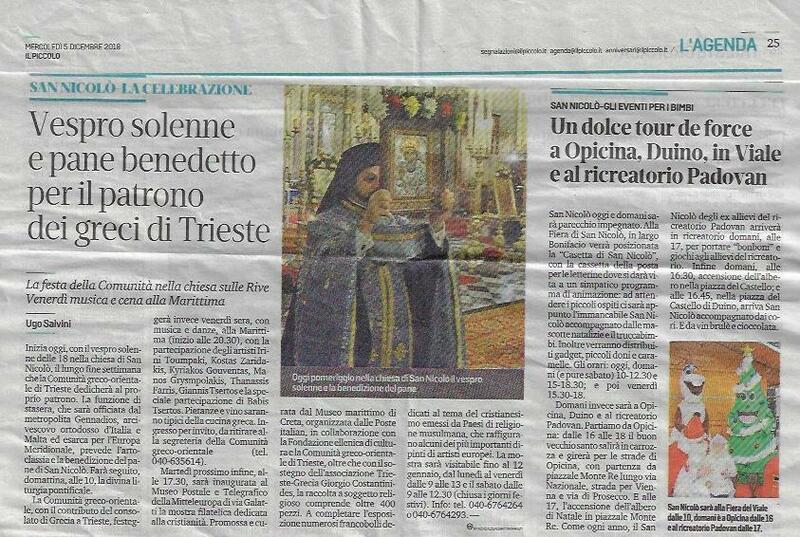 The inaugural event was well-suited in Italy’s press. The collection presented is part of the Museum’s philatelic collections that have been developed over the last few years, has religious content and consists of more than 400 simple series, part of stamps, personal stamps, maximum cards, stamp albums, simple and annual, envelopes and leaflets. Of particular importance is the abundance of stamps issued by Muslim states in religion, a rare type of postage stamps, and related to Christianity. A great part of the exhibition is dedicated to the philatelic works, which present the spiritual journey of the Papae, the great Florentine Renaissance painters, such as Raphael Sanzio (1483-1520), and Andrea del Sarto (1486-1530) , painters from the North, mainly Albrecht Dürer (1471 – 1528) and a particularly important painter on the island of Crete, El Greco, Dominicos Theotokopoulos (1541-1414). 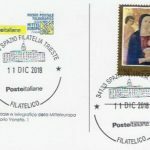 The exhibition also organizes workshops and guided tours to teach philatelic art to children and adolescents as well as to inform about the history and origin of philately. The children participating in the Educational Programs are offering stamps envelopes donated by the Maritime Museum of Crete. This particular project is the result of the objective of promoting the work of our Museum and the visibility of Greece, which is achieved through the organization of international exhibitions. 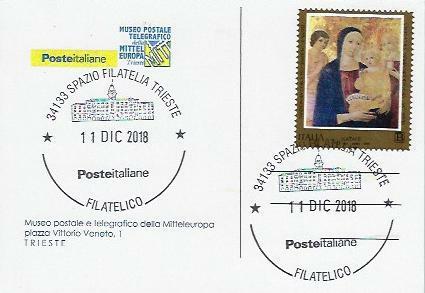 The philatelic exhibition “Christianity” is not unprecedented, since under the auspices of the Maritime Museum of Crete two more exhibitions have been organized in Trieste, and the next exhibition is already being prepared in the same amazing space for the end of 2019. – The President of the Maritime Museum of Crete: Mr. Manolis Petrakis, Commodore (E) HN, ret. At the end of the talks, took place an exchange of souvenirs and a guided tour of the exhibition. Also, took place a small festival with traditional foods from Crete and Italy.